This post is sponsored by Duracell. Hands up if you have a Star Wars fan in your home? We do and he has been waiting for the day to share his love with our kids! I mean, that really is one of the joys of parenting isn’t it– sharing those passions and joys that were so super cool during your own childhood with your kids? And Dad 101’s love of Star Wars is so much cooler than my excitement at recently find Jem and the Holograms on one of our pay TV channels 😉 Anyway, in our home, apparently the time for the sharing is now, largely due to the greatly anticipated upcoming release of the seventh installment in the series, Star Wars: The Force Awakens. 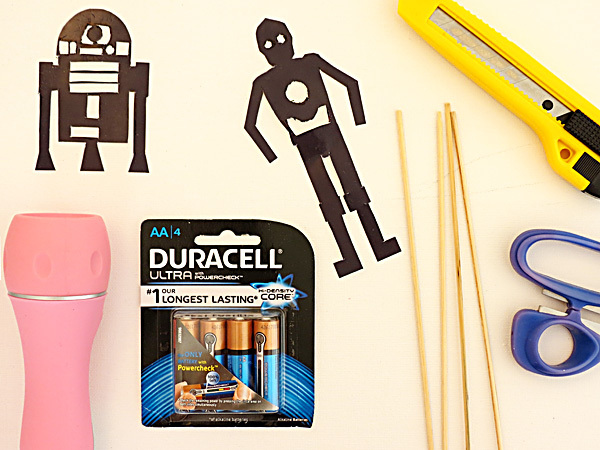 To celebrate the release, we’ve teamed with Duracell, an official partner of Star Wars: The Force Awakens, to power some fabulously fun Star Wars inspired play in your home. 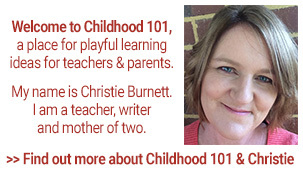 Puppets are one of my absolute favourite toys for encouraging literacy development in children. Playing with puppets is not only about speaking and listening, it’s also about developing story telling skills such as planning, sequencing and comprehension. There are also a whole host of creative, imaginative and social benefits of puppet play. And puppet play is not just for little kids. 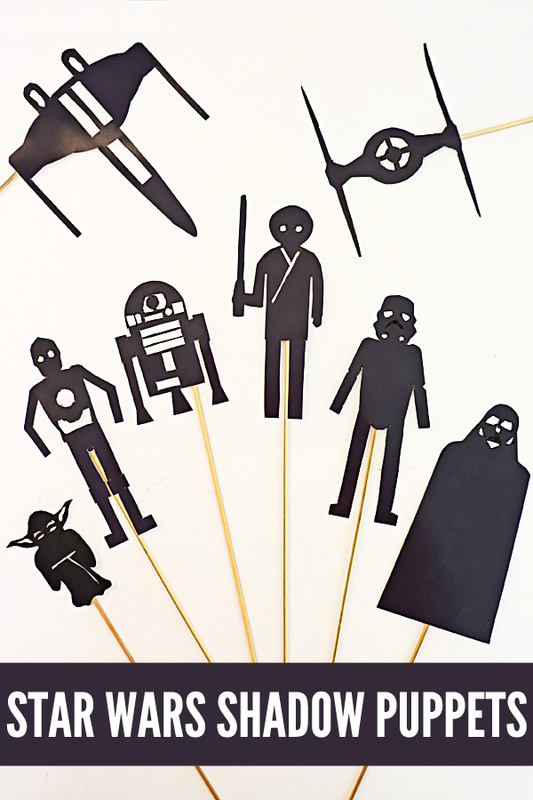 Oh no, hand over a set of these fab printable Star Wars shadow puppets, and school aged children will have a great time creating stories and scenarios together. 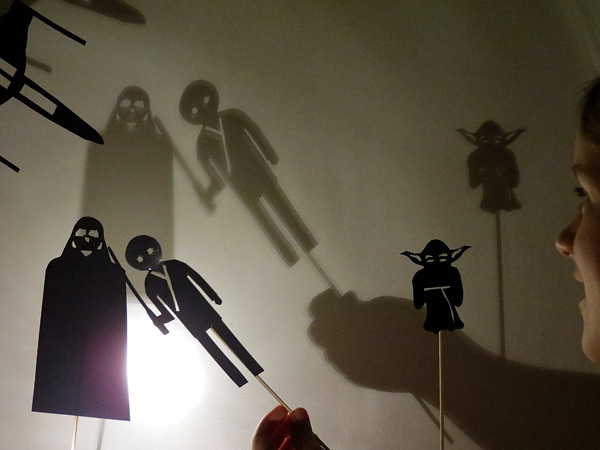 All you need is a torch to power your shadow puppet play, no fancy theatre set up required! 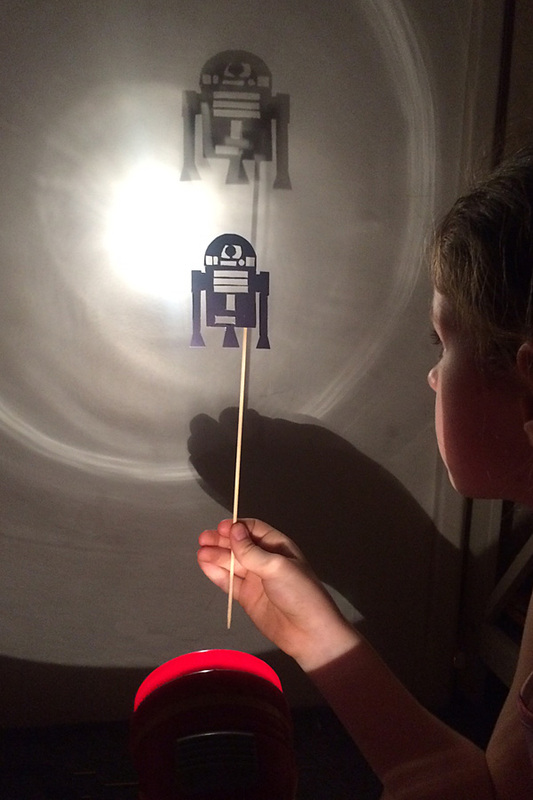 Print out the Star Wars shadow play puppets (see printable instructions above). Cut around each puppet and carefully cut out each white area with the utility knife – you’ll definitely need adult help for this step. Laminate and then cut around each laminated puppet. Tape each puppet to a bamboo skewer or straw. Then your puppets are ready for play! Set up your torch so that it is projecting at the wall and hold each puppet between the light source and the wall. 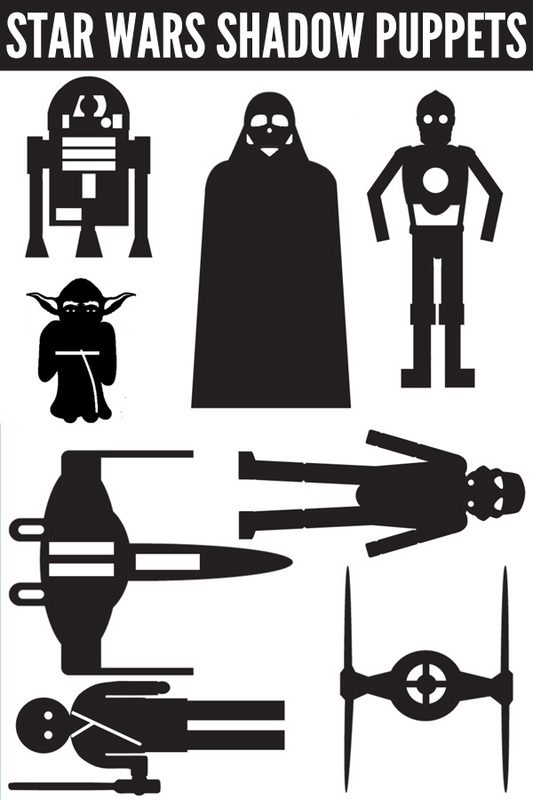 Have fun creating new adventures with these classic Star Wars characters – and just try to keep Dad away from the fun! These are such a super cute idea .... so awesome on so many levels!! In this day and age of instant everything, I love making popcorn on the stovetop. It teaches the kid that waiting can be delicious. These are SO cool. I've just printed them out and Charlie is going to be so excited when he sees them. Thank you! In answer to your question - HARRY POTTER! (And all books in general, really). I have been waiting to share HP with my kids ever since I first read the books myself. 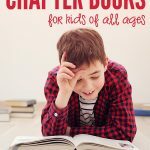 Charlie is now up to book 4 and knows more about the series than I do! I can't wait until he's old enough to read the later books in the series when he will be able to appreciate all of the lessons/commentary J K Rowling has instilled into them. What a great collection of puppets. I recently found and purchased online some wonderful old toys and books that I used to enjoy as a child. Golden Books and other toys that they now call 'vintage'. Anyway, I look forward to passing them onto my own girls and seeing them (hopefully) love them as much as I did at their age. What an awesome idea! SO cool! To take my daughter on bike rides like my dad did with us kids. Rambling, not the verbal kind - although!! Growing up we'd take off into the bush and just explore. Never lost or in danger. The thing that I loved as a kid was bike riding over the summer holidays, can't wait til my youngest loses her training wheels. Jigsaw puzzles! Massive ones with 1000 pieces that take up the whole table. Bonding happens over puzzles: neither can be rushed. Oh my! The shadow puppets are so cool. 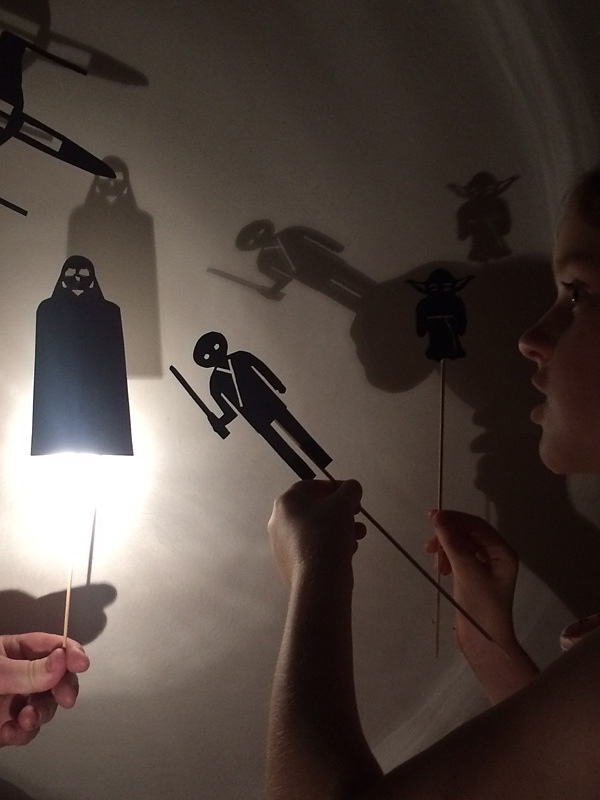 We love Star Wars and Shadow Puppets so they are a perfect combo for our family! Thanks for making them :) The one thing from my childhood I can't wait to share with my son is books. I have some cherished stories that I want him to know. Sharing books and reading together is a memory I want him to have. 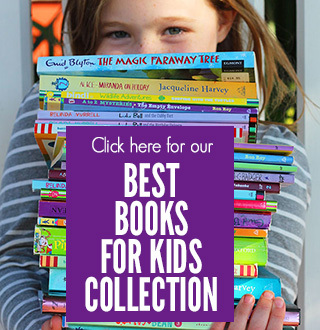 I'm an avid reader and that's something important that I pass down to my kids. Reading is a great Escape, especially when you cannot physically go anywhere, and there's been many a time when I've relied on reading to get me through tough times. Also I want my children to use their imagination and their creative sides, and reading is certainly a good platform to start with. Reading books like Nancy Drew and summer vacations at the cabin! I am so looking forward to taking my son on those day trips I used to go on as a child. One thing from my childhood that I still love today, I can't wait to share with my future children is CUDDLES! Nature and the environment and looking after animals. I love these! So cute Christie. I can't wait to share my love of those retro Santa and little Drummer Boy animated cartoons this year. DVDs are wrapped and ready! Skateboards, because what child does not like a skateboard. Memories of toys of yesteryear, To share with my children, cars we will steer, Building blocks come crashing down, Looking around there's not a frown! My childhood memory is life to share with my son, is being able to ride my bike around the neighborhood until dinner time, we had such fun as kids exploring and having freedom. Its sad that today the children can't do the same as me as a child. Making our own race tracks for our marbles & camping holidays! Mum taught me how to fix the electrics on my remote control truck using salvaged trash. Now my daughter is learning these fun, influential skills! The thing that I want to share with my son, is the simple pleasures I enjoyed during family holidays... fishing, board games, riding bikes, making sandcastles... not a screen in sight! Love these I have two little Star Wars fans at my house. Something from my childhood that I have been dying to share with my kids is horseback riding. I grew up with lots of room to roam and my kids finally have a backyard. It's small but it's perfect for them now. Fab puppets! I love that you don't have to use a a theatre with them. I took my kids to visit a coastal town that I lived in as a child (about 8 hours drive from here), and it was even more beautiful and magical that I remembered. We visited the beach that I walked along every day with my mum and the dog and it absolutely has not changed in all this time, the photographs I took of my girls there are stunning. I remember as a kid (who adored Star Wars) regularly trying to use 'the force' around the house. Cup of water = force it, need to open a door or put shoes on = force it. Mum asking me to do homework = this is not the child you are looking for. 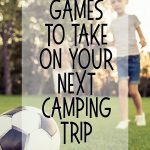 Can't wait to play this with my kids (I'll play along though ;-) ). I use to write stories when I was a child and still do to this day. And reading lots of books . My children love writing silly stories and have a wild imagation like myself. Instead of playing on iPads ...... Using their imagination. I recently shared my childhood by watching Star Wars with them for the first time. I was so excited I sung along to intro music. Memories of a childhood full of years of fun, creative and imaginative playtime, unforgettable afternoons , birthday parties full of joy, siblings and friends playing together. Open their minds up to what is possible. 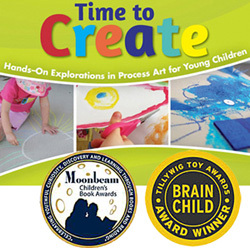 Design things and let their imaginations run wild with pretend play. 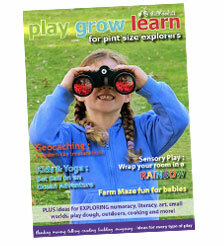 Intrinsic play value creating hours of fun. Welcoming in a New Year Brings much excitement, and much cheer As midnight strikes, they're already asleep Once they're older, we'll make memories to keep! Christmas and New Year camping at one of my favourite camp sites at Amity Beach on North Stradbroke Island. The magic of how Santa found us at the beach, some beautiful person dressed in the hot suit and visited all the campsites to see all the kids in the lead up. It's right on the beach which is why we haven't gone yet but I have fond memories of spending the hot summer days in the ocean or going exploring along the beach or driving and going for bush walks around blue and brown lake, evenings eating the beautiful fresh seafoods and at night the sounds of the ocean as we were going to sleep exhausted from all the moving we did that day. We made these and Master 6 yr old has loved them. He hasn't even watched Star Wars but is a fanatic after reading books. Thank you. We will now try the memory game. Childhood memories of my large family and only dad went out to work and mum stayed home and took care of the children and the house. We spent all the holidays and after school outside bike riding, fishing for guppies in the drain and selling them for 10c on the front lawn, making lemonade from our lemon tree and selling that for 5c role playing with our parents old clothes. Mum teaching us how to cook and dad teaching our brothers all that boy stuff. Weekends were spent doing our chores and after we were treated to picnics at the beach and spending quality time with each other. Toys were bought from the damaged rack for next to nothing and dad fixed them like new we still have most of them today and they have been passed down to our children and have standed the test of time as we were taught to respect what we were given and this has been passed on to our children . And thank you for your brilliant ideas for some simple inexpensive fun this also played a huge part as we were growing up dad was a fantastic artist and drew pictures for us to colour in as there were no printers back then. For me, it's seeing their love of art and creating things grow as they do. It warms my heart. My Dad's stories. I can't wait until my son is old enough to hear the stories I grew up listening to. Being totally immersed in a favourite book. 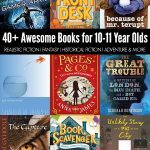 We read every night but I can't wait to see them absorbed in their own book worlds. As a child i loved going on road trips. Cant wait till next Christmas holidays to take them across the Australia and see the Great Australian Bite. Can't wait to take my kids to India durung the festivals of Holi and Diwali, after all nothing beats the fun of water balloons n colour and fireworks and sparklers and just seeing them have fun, and enjoy a new different experience. Elephant rides too! Spotting wallabies, as it nears dark, Camping in a National Park. The wonder of nature I can’t wait to share, With my crazy little pair! Hiking with the kids along a broken mountain pass, camping overnight under the stars so vast and leaving behind every electronic device! Our family use to spend Sunday mornings helping old people out at a nearby AGED CARE - I want to start this ritual with my kids. I am now sharing my LOVE of reading and books with my two grandsons. I look forward to making and decorating cookies with my kids this weekend to share with friends and neighbors! Merry Christmas! I'm the Editor of Fun Family Crafts and wanted to let you know that we have featured your shadow puppet idea! 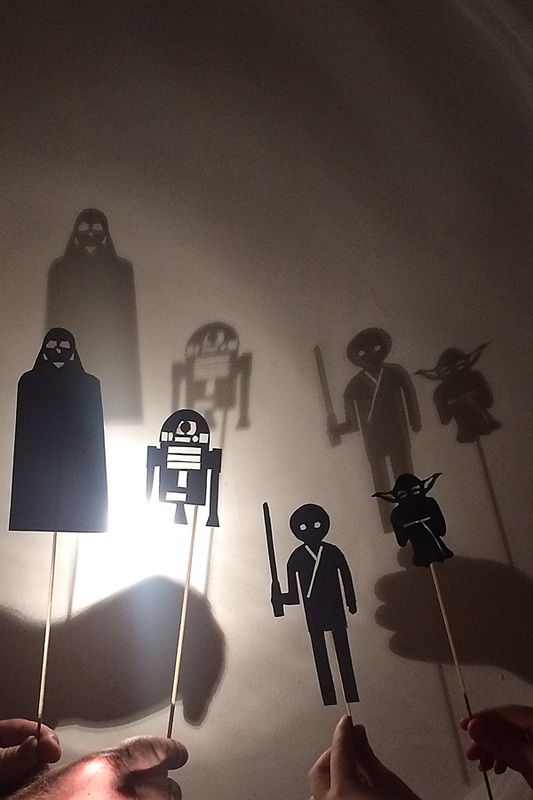 You can see it here: https://funfamilycrafts.com/star-wars-shadow-puppets/ If you have other kid-friendly craft tutorials, we'd love for you to submit them. Thanks for a great project idea!